Tell us a little bit about your business and your art. How long have you been doing what you do and what is your favorite thing about doing it? 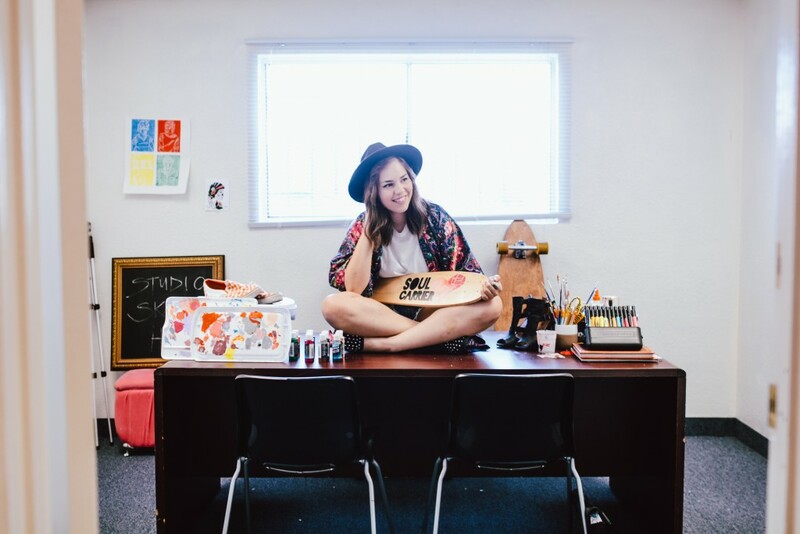 I’m Paige Poppe, and I work under my own name as an artist! I design + create handpainted skateboards, signs, prints, and other goods. I work in acrylic and watercolor, and I paint every day! I have been serious with my art for almost exactly a year now! I got my start on Etsy when I was a sophomore in college, and I have grown it since. I began by focusing mainly on custom handpainted skateboards, but I am really happy to have expanded and offer a variety of artwork in my shop and to commission clients. My favorite thing about being an artist is simply creating the pieces. I am constantly making things and working with my hands, and the process of creating something from scratch is so exciting for me. And I also LOVE seeing + hearing my clients reactions. It is so cool seeing my art hanging on their walls. I would describe my art as warm and organic. Especially when working with wood pieces like skateboard decks or signs, I like to reveal as much of the natural wood grain as possible. I think the contrast of the paint and wood is really beautiful. Do you have a favorite project or piece you have worked on so far? 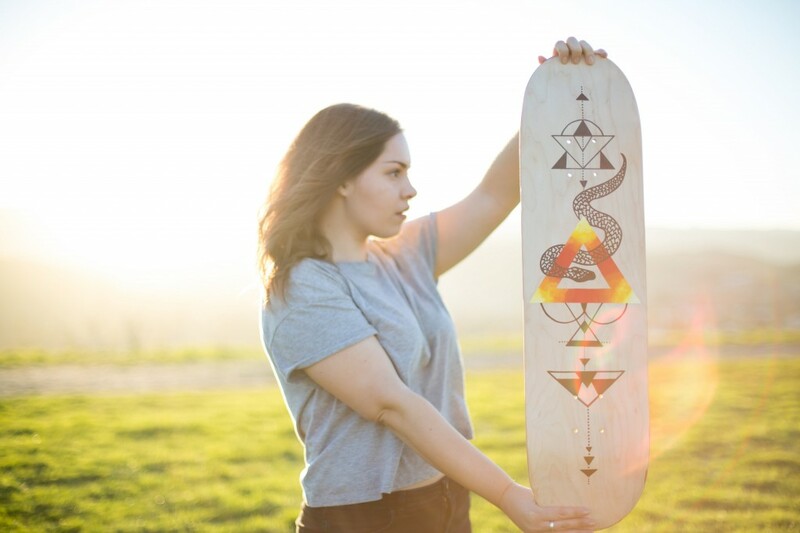 I have this one skateboard deck that is my absolute favorite of an ombre triangle that looks like a sunset, and also has geometric elements and a snake as the focal point. I literally dreamed the design, woke up that morning, pulled all of my paints, and painted the deck in the sunshine of my front porch. I love that design, but also the whole experience of painting it was really special. I have been creating and painting things since I was little. I’ve asked my mom about it before, and she’s like, oh you’ve always been like that. But to be honest, I never knew if I could be in a position to make money from my artwork. I am about to graduate with my architecture degree (next weekend!) so I had planned for an architecture career. But now I plan to grow my art business, and would love to marry these two passions in the future. Traveling creates a ton of inspiration for me, and it was actually after I lived in Copenhagen for a year that I really started getting serious about sharing more of my artwork. When I was surrounded by such beautiful architecture and textures, I just couldn’t help but feel compelled to paint them. I also have just recently found so much inspiration in nature, and paint cacti and leaves somewhat obsessively! Definitely Instagram, and you can follow me over there @PaigePoppe! As an artist, the most important thing to do is share photos of my work so my clients can see what I’m up to! But I will say, Youtube is a close second. I’ve started filming more painting process videos, and those are pretty fun to watch because you can see the work in action. I honestly never expected to make as many friends in the creative community. These friendships are both online people I haven’t met in person, like you Charisma, but also people that I now spend time with multiple times per week. That is something that has been incredibly fun and I am so grateful for it! It is amazing to call so many likeminded people my friends. I am a super goal-oriented person, and I think they really help me achieve my dreams, so I will have to just list a bunch! Success to me is the ability to inspire others and collaborate with other creatives. I think when we all team up as a community is where the magic really happens! For the future, I would definitely define success as being self-employed, but for now I will continue pursuing side architecture + creative jobs as well as my artwork. Don’t forget to download her awesome free print!